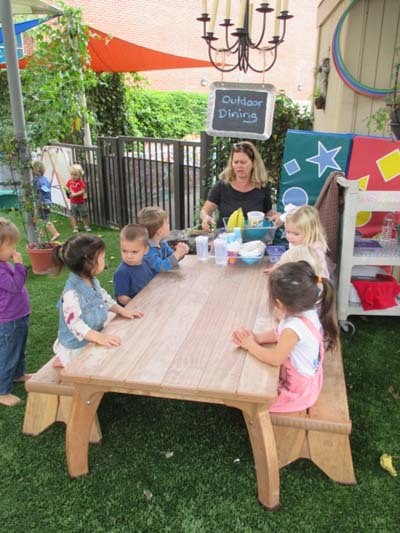 The Early Childhood Lab School at Orange Coast College in Costa Mesa, California, has fulfilled a “dream” by becoming a Certified Nature Explore Classroom. The Lab School is a teacher-training site for the college’s Early Childhood students and serves children age’s two to five in a preschool setting. 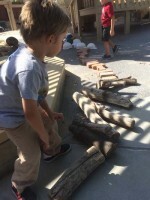 Over the past 28 years the staff, faculty, students and families have developed the outside play areas from a stark, dirt clogged, unshaded area into two beautiful Outdoor Classrooms. 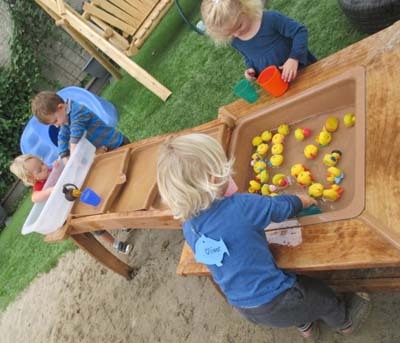 Our preschool and pre-k classrooms open onto the wide expanse of the outdoor environment with a large hanging sign announcing the Outdoor Classroom. Two wooden climbing structures dominate one-third of the yard. This is where children develop their large motor skills and enter into the world of fantasy. 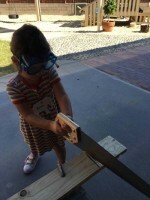 Pirates, firepersons, police, florists, chefs, superheroes and anything the child wants to be is possible. Several trees provide canopies of shade over a garden swing, a hill, our children’s garden area and “Peace Corner”. The art area is part of the garden and children are able to be creative under the shade of a fig tree and passion fruit vines. A covered sand area has loose parts that encourage imaginative building using natural items. 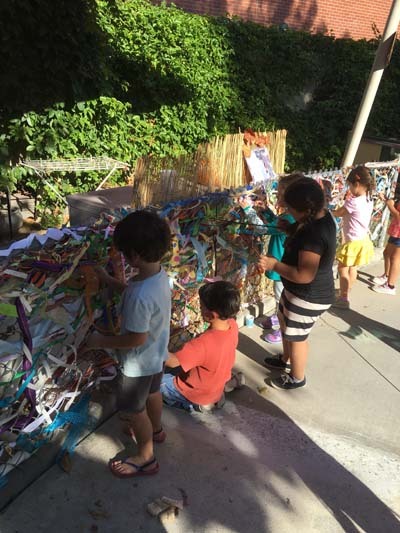 Sounds of chimes, drums, a xylophone and other musical instruments waft through the air as children explore the Music Garden. At the other end of the yard the tap, tap, tapping of hammers is heard as children try their hand at woodworking in our will equipped Woodworking area. The Outdoor Classroom for our younger children is right outside their classroom door. 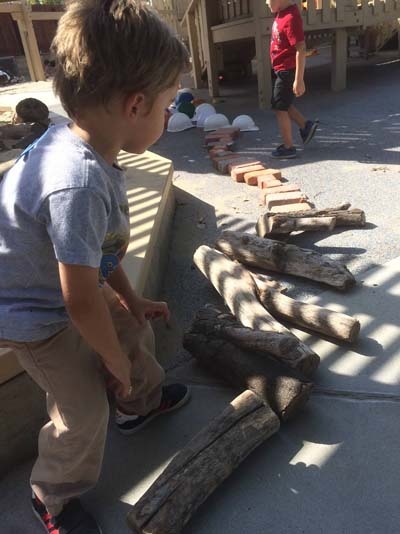 Under the shade of a large mulberry tree and a tent canopy, the children develop gross motor skills on balance beams, a small wooden climber, obstacle courses, and by building with large wooden blocks. They enjoy snacks at their Outdoor Dining area which is adorned with a chandelier. Cooking is a favorite activity in the vine-covered sand area. 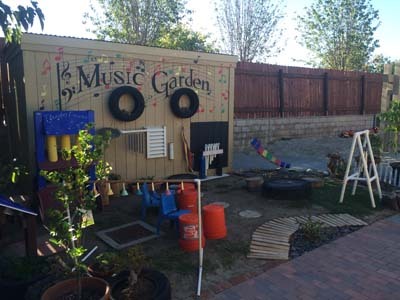 The creative corner of the outdoor space gives children the opportunity to play with and explore sounds in the Music Corner and paint in the Art Area. 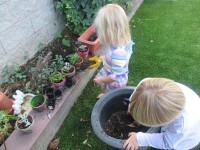 Natural loose parts are available to feel, smell, examine and create with. A wooden cascading water table also contributes to the sensory-based learning that is so important at this age. 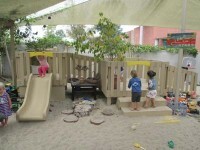 In the Outdoor Classrooms, greenery and potted trees and plants surround the children. They are given the opportunity to plant, nurture and harvest a variety of foods and flowers and notice and learn about the “bugs” and creatures that inhabit the yard. We are a Certified Monarch Butterfly Way Station. We are very grateful to the Lab School staff, past and present, ECE faculty and students, parents, OCC staff, and community members who over the years have given of their time, talent, and resources to establish a beautiful, exciting and enriching Outdoor Classroom in which children may flourish.